John Krasinski's smartly-executed monster movie grabs you and doesn't let go. 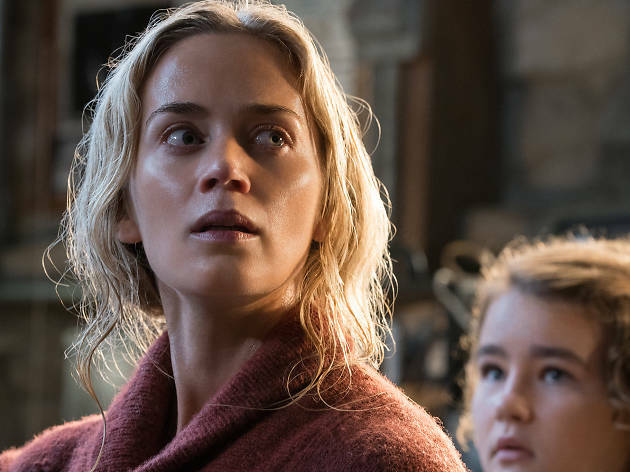 ‘A Quiet Place’ is like ‘Aliens’ retooled as a militant librarian’s fantasy. Actor-director John Krasinski’s relentless shocker thrives on a nifty premise: in a post-apocalyptic near future, a family must survive in a world where the slightest sound brings out deadly monsters. With minimal dialogue – characters communicate by (subtitled) sign language, eye contact and whispers – ‘A Quiet Place’ is pure, bold cinema, its images and creepy sounds working together to scare the bejesus out of you. Save for some late-in-the-day news headlines, Krasinski admirably gives us little backstory for the monsters. 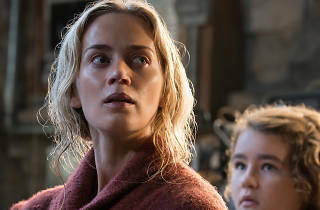 Instead, mum (Emily Blunt), dad (Krasinski), son (Noah Jupe) and daughter (Millicent Simmonds), whose deafness means she can’t hear the beasties coming, are just shoved through the mill. Nerve-shredding set pieces revolve around a nail sticking out of a stair, a flooding basement and a ‘Jurassic Park’-like run through a field. All done with ruthless brio. The rules of this world are fast and loose, so the monsters can’t hear over waterfalls but can listen through walls. It’s a neat allegory for the challenges of parenting in a crazy world. The family dynamics lack nuance, but real-life husband and wife Krasinski and Blunt bring poignancy, the CG beasties are striking and the film pulses with ideas. It all adds up to a monster movie to shout about. Or maybe not. Not sure at all why this film is getting such positive reviews. The central premise - don´t make a sound - is interesting for about 5 minutes tops. The rest is a fairly bland survival / post-apocalyptic thriller that we have seen a hundred times before, and often done much better than this. Disappointing. It was certainly full of surprises and tense moments but there were just too too many logic flaws in it for my liking... you have super alien beings with astonishing hearing that are able to distinguish the footstep of a human from the rustling of a rabbit! Nope... just not possible! They should have made it voice specific, then it would be so much more believable... Superb acting but dodgy plot; but seems good enough that there is a sequel in the works! Very surprised by some the negative comments on here, I thought this was a great film. It's a shock to the senses to sit through an entire film with essentially no noise and some of the plot decisions definitely veered away from predictable. The family we see are deeply affected by a tragedy but are rebuilding their lives and are expecting a new addition in a world where noise is prohibited. Sure, there are some possible plot holes but it's pulsating and unique and on the right side of terror when it comes to the horror genre. Quite surprising having in account there’s only 5 actors in it and hardly any words. Regardless the tension comes out of the screen and leaves grabbing to your seat from minute one. This is one to see on a cinema screen. THE best ninety minutes of film I’ve seen in the cinema so far this year. High praise maybe but thoroughly deserved. In ‘A Quiet Place’, actor and director John Krazinski delivers unwavering tension punctuated with jumps that literally saw me, and everyone else in the cinema, lift two feet out of their chairs. Oh and added bonus to a movie like this? No one brings snacks into the cinema...hurrah! Go see this film and be assured of a gorgeously nacho-free experience! The first big scare of the film arrives only a few moments in and might be familiar if you’ve seen Krazinski and wife & co-star Emily Blunt doing the talk show rounds which is great as it means you then have no idea what’s still to come. Dropped into the middle of the action, there’s very little information given as to what's come before and I liked this...too many films waste precious moments spoon-feeding audiences everything they think we need to know when actually, if the script and performances are strong enough, we can usually figure out enough to get by. The monsters are excellent; gruesome, nimble of foot and gigantic of ear, they bring a new dimension to the horror that comes from knowing you cannot make a sound lest you invite them to find you. Blunt and Krazinski are both every big as good as you’d expect them to be although I definitely think their real life couple status helps some of the more tense and moving scenes but it’s the kids who are the real standouts. Intelligently written and realistically portrayed, these are not the annoying movie children of horror films of the past, they demand your engagement and your sympathy and received both from me by the bucketload. At a brisk 90 minutes this beautifully acted and crafted horror is so much deeper than what you initially think, the main reason for its power is the family crisis at its core. They're trying to survive not only the monsters who roam around them outside but the demons within. This was one of the only horror films I genuinely cared about the characters, the more you care the scarier and more emotional it becomes. "Who are we if we can't protect them?" Emily Blunts character asks her on screen (and in reality) husband John Krasinski, a question and worry every parent has it also deals with a relationship between a father and daughter and the looming presence of a new born in this silent world this family are forced to live in, surely an impossible thing to do but her pregnancy reflects the family's determination and unity. Gorgeous moments blended into extremely tense and jumpy scenes; When Krasinski brings his son to the waterfall where they can finally let out that scream of relief and when Krasinski and Blunt slow dance to Neil Young's 'Harvest Moon' through earphones. I would highly recommend this film if you enjoyed 'Get Out' and 'The Babadook' then you will definitely appreciate this film. Once again, a great movie trailer convince you to go to cinema only to realise that this is actually more of a rubbish movie. From the moment it starts, you realisie that there are a lot of things that do not make sense and there is no connection between them but were just there to help the story moving on. Predictable story from start until the end, having low budget & bad acting. This story of survival, and resourcefulness is well-made, from the sound design to the economical use of speech. Perhaps unusually for a post-apocalypse film about constructing a new civilization out the remains of the old one, the antagonists remain the mysterious creatures, rather than desperate other people. If you're feeling generous, you can see this film as full of metaphors about the ambiguous nature of both disability and parenthood. This is such a predictable film. A family who have survived devastation of the world it seems, and the cause of the devastation is - monsters! So, because the monsters can seek out humans by the noises they make, the film is mostly silent, punctuated by the odd bang, thwack or scream every 15 minutes when we get a few seconds action of monsters chasing humans. Emily Blunt's superb talents are wasted in this ludicrous "plot". My evening wasn't wasted though, I laughed all the way through.